1. The Broncos received a chilling wake-up call in the post-Wayne Bennett era last night. 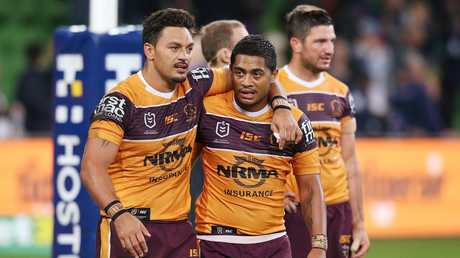 New Brisbane coach Anthony Seibold's Red Hill era started awfully as Melbourne - the best team of the past decade - taught the Broncos a lesson in what it takes to be great. Brisbane were flat, error-riddled and lacked energy in the midfield. 2. Brisbane will be sweating on the health of star centre James Roberts. The NSW Origin flyer lasted just six minutes before hobbling off with a nasty back injury. The Broncos can ill-afford to lose their No.1 strike centre for an extended period. 3. Brisbane's forward pack needs to step up quickly. Seibold has demanded more of his forwards this season but they were hammered in the opening 20 minutes by the Storm. The likes of Matt Lodge, Joe Ofahengaue and Tevita Pangai Jr must be more aggressive in midfield. 4. Halfback Kodi Nikorima must address some flaws in his defensive game. Nikorima missed two simple tackles in the lead-up to the Storm's opening try and he was caught in no-man's land when Kenny Bromwich crashed over for a 16-0 lead. 5. There are question marks over Matt Gillett's selection at lock. Gillett defended admirably but struggled to assert himself in midfield against Melbourne's monsters. He needs time to find his groove from a fractured neck but Gillett is better suited as a hard-hitting back-rower on his beloved right edge.